If trees could talk, what would they say, Would they talk of the past, or tomorrow of today? Nature Nurture are on a mission to connect urban communities with the nature on their doorstep. "Hmmm - but how can we do this? There's just so much noise to break through." Well we have come up with something: We reckon that if we can give nature a voice, people just might listen. I love nothing more than to draw amazing people together with a shared vision; diverse skills and experience feeding into the design process from the concept stage. That’s just how Talking Trees came about. Last week an amazing brainswarm took place. A coming together of ecologists and technologists, installation artists and sonic artists, programmers and electronics engineers Forest School leaders and thought leaders. We’re dreaming up all sorts of possibilities - ultrasonic directional sound, buried bone conductors, woodland animal hats with wireless speakers, ibeacons, audio spotlights ... it's all pretty exciting. 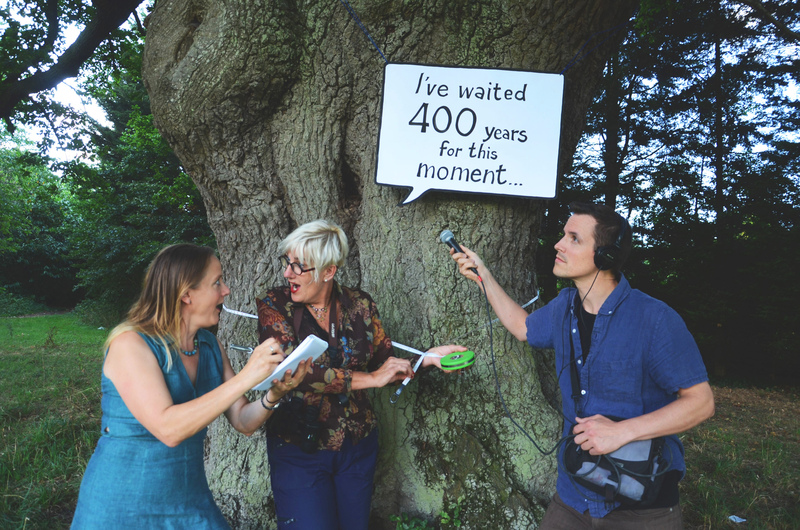 What's more our friends at The Woodland Trust think it's a brilliant idea and have commissioned us to make 10 trees talk as part of London Tree Week! Can't wait. Thanks to the AMAZING team Green Trees, Think Engineer, William Mathew, Richard Bentley, Richard Ganpatsingh and ThinkLockhart. Positive health outcomes are linked with access to natural environments rich in biodiversity. The State of Nature Report 2016 revealed that 56% of our native species have declined over recent decades. The HLF State of Parks report 2014 shows our urban green spaces are under threat and highlights the need for communities to take on a greater role in their care. Meanwhile we are less active than ever before and our health system is in crisis. Our sedentary lifestyle is leading to rising levels of obesity & stress. Poor Air quality is endangering human health.People need nature. Nature needs people. Our solution is to co-design Talking Trees with technologists, ecologists, creatives and our community, built upon 5 years of achieving positive outcomes for health, wellbeing and environmental stewardship through our previous nature engagement projects. Talking Trees connects people with trees. In doing so, their physical activities increase and they experience the restorative effects of nature. Spending time in the natural environment is the first step towards raising awareness of and engagement with environmental issues. Roll up Roll up for the first Talking Trees experience - Prospect Park Reading, 13th April, 11am to 3pm. More details soon. One Response to "Talking Trees – is this really possible?" The last two years we have been working with different universities around the world to use different data streams of trees around the world and turn these into music. The World Premiere of our Talking Trees will be presented on a festival on the boarder of the Netherlands and Belgium on the 19th of august this year. Than a whole circus starts with different PR outlets. What do you think, could we work together on this? ← Nature Nurture Wins Pride of Reading Award!